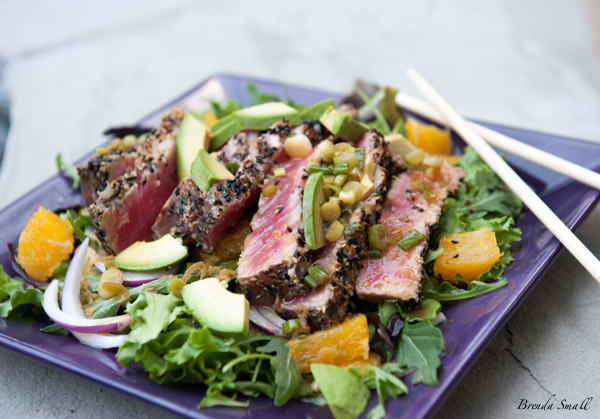 This awesome combo of sliced, sesame seed crusted, seared tuna, baby greens, avocado, oranges and purple onions drizzled with an Asian vinaigrette will take your taste buds on a ride! 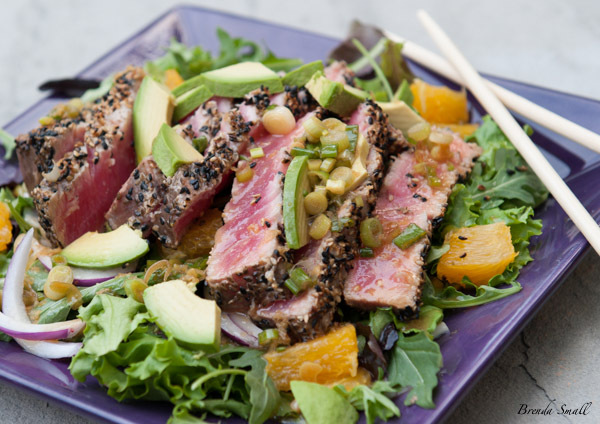 If Asian flavors and seared tuna combined with an interesting salad of baby greens, avocado and oranges and finished off with a great Asian vinaigrette sounds good, you will love this salad! Chief did a great job searing this tuna! It is prepared perfectly…seared and crusty on the outside, and raw in the middle. 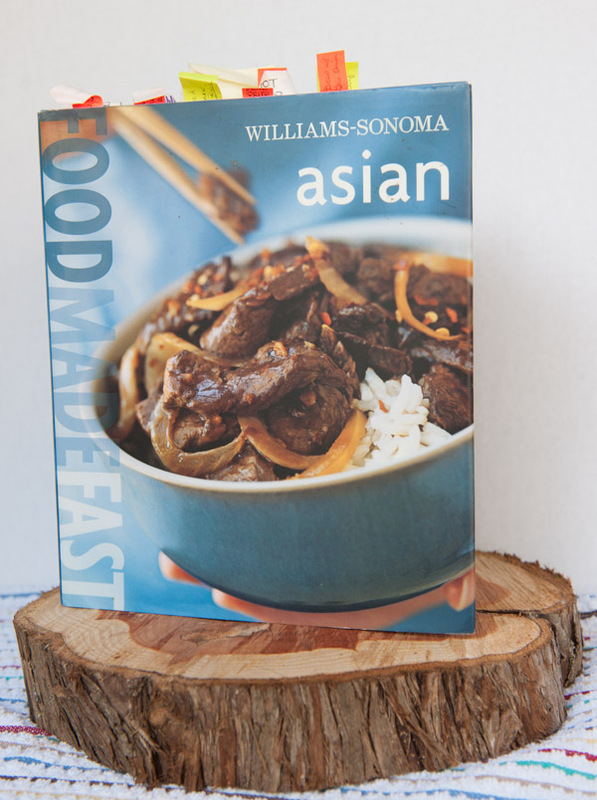 The inspiration for this wonderful Asian salad came from the “Williams-Sonoma Food Made Fast Asian” cookbook. I absolutely love that cookbook! As I have said before, I’m crazy about Asian food, especially Thai, and this cookbook is one of my favorites for Asian recipes. I have tried 8 recipes out of the cookbook, and I would rate all but 1 with 5 Stars! I will post them as I get them made again, written up and photographed. If you have the cookbook and want to try one of the recipes, do it. The ones I have tried are great. Have any question about the cookbook or recipes in the book? Feel free to ask me in the comment section of the blog or shoot me an email. This is one of my favorite Asian cookbooks. I have only made one recipe out of this cookbook that I was not in love with. As you can see, I have lots more marked to try! Most members of our family love seared tuna, well, except for the girls. The best way to prepare it is to sear the outside over very high heat and leave the inside raw. I have a searing pod in my outdoor kitchen, which is perfect for preparing the tuna. If you are using a charcoal or gas grill, get it as hot as possible. 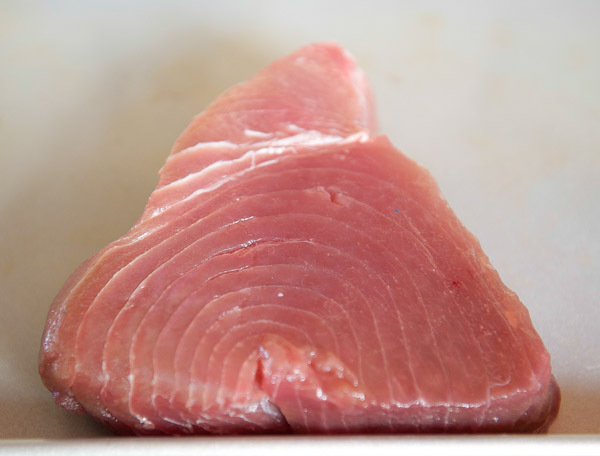 The tuna could also be seared on the stove, using a preheated grill pan or cast iron or heavy skillet. You will need these ingredients to prepare the Sesame-Crusted Seared Tuna Over Salad Greens. Add to these the tuna steak and the salad greens for a perfect Asian entree salad. This salad has lots of great Asian flavors! 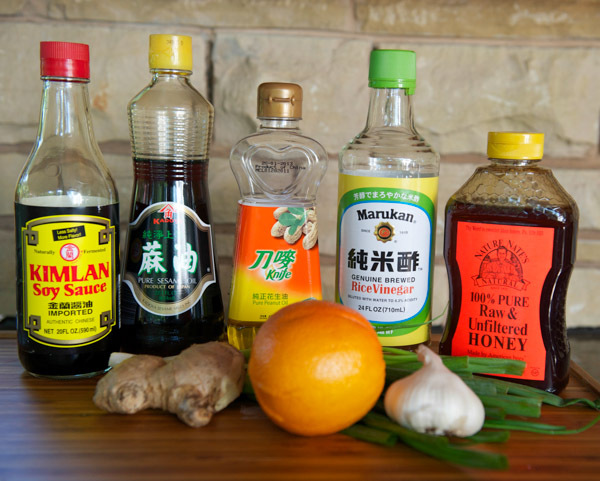 The dressing includes some of my favorite Asian ingredients…fresh ginger (no need to peel, just trim off the knobs or bad spots and finely grate), rice vinegar, soy sauce and sesame oil. The salad ingredients have an interesting mix of baby greens, oranges, avocado and slivered purple onions. Add in the mixed sesame seeds, and you have the perfect salad. It is definitely one of our favorite summer entree salads. This tuna is also great served as an entree, with the salad served separately. This would be a perfect tuna steak for this awesome salad. Using a sharp knife, cut a slice off of the top and the bottom of the orange, then stand the orange upright. Following the contour of the orange, slice downward to remove the peel and the pith. Then, cut the orange into sections on either side of the membrane. Be sure to save the juice to use in the vinaigrette. Set aside. Place the tuna steaks on a small plate or other flat pan with sides. Lightly sprinkle the salt and pepper on each side of the tuna. Pour just enough of the vinaigrette over the tuna to cover the top. Then, flip it over and lightly coat the other side. Allow to sit, coated with the vinaigrette, about 30-40 minutes or until the tuna comes to room temperature. On a small plate about the width of the tuna, mix together the two types of sesame seeds. Clean the preheated grill and spray with cooking spray. Place the tuna steaks on the hot grates. Transfer the tuna to a platter and allow to rest about 10 minutes. In a large salad bowl, gently toss together the orange segments, lettuces, avocado, slivered purple onions and a small amount of the vinaigrette just until all of the ingredients are coated. Slice the tuna about ¼" thick. Mound the salad on 4 salad plates, top with the tuna slices and drizzle with a small amount of the vinaigrette. You could lightly sprinkle with sesame seeds for garnish. This tuna is cooked perfectly. This salad is the BEST! !